Park Forest, IL-(ENEWSPF)- Park Forest Police Officer Tim Jones visited his fellow officers at the police station Wednesday. The man marches still, with determination, toward recovery. The department shared a photograph from Officer Jones’ visit on its Facebook page. “Thanks for the continued support!” police added. Officer Jones left the rehabilitation hospital on May 26, 2017. 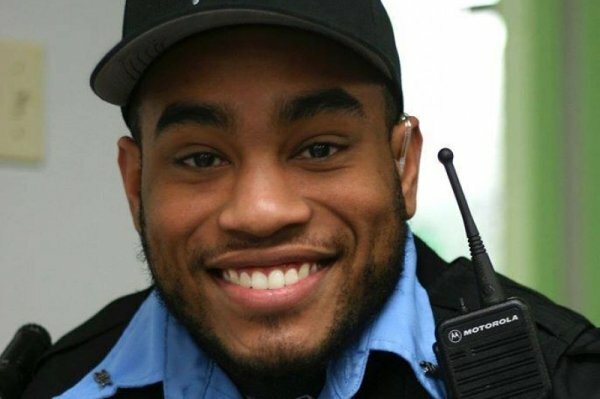 In November 2017, police began raising funds for the Officer Timothy Jones Scholarship. The unaugural recipient of the scholarship was a 2018 graduate of Rich East High School, Omar Smith Jr. Police presented Mr. Smith the $1,500 award for his future education at the Village Board meeting on Monday, May 21 of this year. Officer Jones has met all challenges before him so far in his recovery. A video below from WGN9 details some of his remarkable success. eNews Park Forest wishes Officer Tim Jones continued recovery and success.